Video footage sent back to China, for what? Comprehensive espionage… Are U.S. manufacturers no longer making camera equipment or offering surveillance technology? What that any part of the trade deals President Trump signed with President Xi? Anyone? The Memphis police use the surveillance cameras to scan the streets for crime. The U.S. Army uses them to monitor a base in Missouri. Consumer models hang in homes and businesses across the country. At one point, the cameras kept watch on the U.S. embassy in Kabul. All the devices were manufactured by a single company, Hangzhou Hikvision Digital Technology. It is 42%-owned by the Chinese government. More here. Its state-of-the-art surveillance cameras monitor the movements of millions of Britons going about their daily lives in airports, government buildings, sports stadiums, high streets and stations. Hikvision, a company controlled by the Chinese government, was recently revealed to be Britain’s biggest supplier of CCTV equipment, raising fears its internet-linked cameras could be hacked from Beijing at the touch of a button. Last week, undercover Mail on Sunday reporters posed as businessmen to infiltrate its headquarters in the ‘surveillance city’ of Hangzhou in eastern China, to investigate its activities. What they found will raise fresh cause for concern about a company whose growing influence in the UK has already been questioned by former MI6 officers and Security Ministers. Far from being the independently run business it claims to be in its customer-friendly marketing, Hikvision is controlled by China’s ruling Communist Party. These capacities enable the Chinese authorities to track dissidents, activists and human-rights campaigners, who are routinely rounded up and detained. As it rapidly expands its global presence, Hikvision has been generously bankrolled by Chinese state banks, which critics say give it an unfair commercial edge. It received £2.4 billion from China Development Bank in December and a further £2.3 billion loan from the Export-Import Bank of China in August, both of which are controlled by the Chinese government. More here. According to yearly independent research data from IHS Market, Hikvision accounted for 19.5% of market share in global video surveillance industry in 2015, up from 4.6% in 2010, and has been ranked the No.1 market share leader globally for video surveillance equipment for five consecutive years. In 2015, Hikvision was ranked first in EMEA market with 12.2% market share, and was ranked second in Americas market with 7.3% market share. VOA/WASHINGTON — Imagine a world where almost everyone can be tracked, and everything can be seen by cameras linked directly to the Chinese government. The rapid growth of a little known Chinese manufacturer of high-powered surveillance technology has some people concerned that it’s no longer a theory. American flag waves beside CCTV cameras on top of the U.S. embassy in Berlin, Germany, Oct. 25, 2013. Hangzhou Hikvision Digital Technology, a company controlled by the Chinese government, is now the world’s largest supplier of video surveillance equipment, with internet-enabled cameras installed in more than 100 countries. Capable of capturing sharp images even in fog, rain or darkness, Hikvision claims its most advanced technologies can recognize license plates and tell if a driver is texting while behind the wheel. They can also track individuals with unrivaled “face-tracking” technology and by identifiers such as body metrics, hair color and clothing. In the United States alone, the company’s surveillance systems can be found everywhere from prisons to airports to private homes and public schools, and even in places with sensitive national security concerns, such as Fort Leonard Wood military base in Missouri. Abroad, its cameras were installed in the U.S. embassy in Kabul, Afghanistan. According to a U.S. government procurement document published on IPVM.com, the world’s largest online video surveillance trade magazine, U.S. embassy officials decided in August 2016 to allow only Hikvision suppliers to bid on the installation contract. Stephen Bryen, a widely published expert on international affairs and cyber security, wrote an article outlining his concerns about the purchase, saying the Hikvision cameras were never proven to be any more secure than comparable models. “If the procurement officer actually thought these cameras were more secure than others, that would have been claimed as part of the sole-source justification,” he said of the embassy purchase agreement, adding that no claims of any kind were made regarding the Hikvision products. On Monday, a State Department official confirmed the installation via email. It is not known whether other Hikvision products have ever been installed in other U.S. embassies. Edward Long, a former employee of a video surveillance equipment company in Florida, recently petitioned the U.S. government with a letter warning that Hikvision cameras are sending information back to China. Frank Fisherman, a general manager for Long’s former employer, IC Realtime Security Solutions, tells VOA that Hikvision devices are engineered for effortless hacking. “They have their encrypted information set up so they can access even if you change the admin [passwords] and the firewall,” he said, adding that Hikvision may have set aside a “back door” in the production process, such that the manufacturer can monitor devices remotely without the users being aware. IPVM President John Honovich, however, strikes a less alarmist tone. 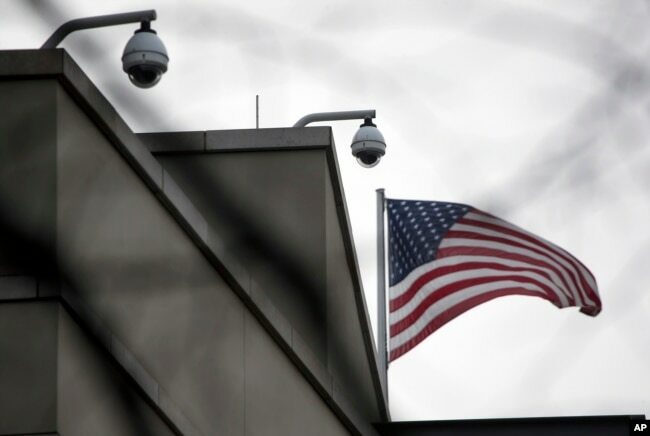 “So far, we haven’t found any evidence showing these cameras are sending information back to China, and there is no evidence of such back doors,” he told VOA, cautioning, however, that these facts alone do not rule out a possible security threat. Among well-known video surveillance equipment manufacturers, Honovich added, Hikvision products may not be worth the risk. Established in 2001, Hikvision, which originated as a Chinese government research institute, maintains strong ties with that government. More than 42 percent of the company is owned by China’s state-owned enterprises, with the remaining stock owned by a combination of general public stockholders and venture capital investors, including 18 percent from private equity in Hong Kong. In 2015, when Chinese President Xi Jinping went on an inspection tour of the southern city of Hangzhou, capital of Zhejiang Province, he visited Hikvision’s main office instead of the famous Alibaba headquarters. Xi also met with Pu Shiliang, 38, Hikvision’s head of research and development. According to the official website of Zhejiang Police Academy, Pu is also the director of a technology laboratory within China’s Ministry of Public Security, the main domestic security agency that has long been criticized for tracking and detaining dissidents and perceived Communist Party opponents of any stripe. Beginning in 2015, China’s state Development Bank and Export-Import Bank provided Hikvision with 20 billion yuan (nearly $3 billion) in low-interest loans and a 20 billion yuan line of credit. Loans of this size are typically unavailable to Chinese or foreign companies. Despite the enormous security implications, the United States appears to have made no national security assessment of Hikvision products. As indicated by Long’s online petition, which ultimately closed with only 15 supporters, Hikvision’s links to Beijing are virtually invisible to American consumers. In Britain, where many Hikvision cameras have been installed, some government officials have begun voicing concerns. “If you’ve got cameras that are IP enabled, or potentially could covertly be so enabled … they could potentially be used for malign purposes,” Nigel Inkster, a former British intelligence official, told The Times. Voice of America received no response to multiple attempts to contact Hikvision’s headquarters in Hangzhou and its branch in California. Jeffrey He, president of Hikvision’s U.S. and Canadian branch, defended the company during an undated interview with U.S. security monitoring website SourceSecurity.com. “There have been some misguided accusations targeting Hikvision’s public and industry image, sometimes seeking to create controversy where none exists,” he said. “These questions are geared in general not just to Hikvision, but also to many Chinese manufacturers, and none of these accusations have been proven to be true. These accusations are baseless. Posted in China, China aggression, Citizens Duty, Cyber War, Department of Defense, Department of Homeland Security, DOJ, DC and inside the Beltway, Failed foreign policy, FBI, government fraud spending collusion, Industry Jobs Oil Economics, Military, North Korea, Russia, Terror, The Denise Simon Experience, Trump Administration, Whistleblower.